It isn’t all about caimans and sea turtles here. As I mentioned before, RPT has numerous projects and each day is broken up into work on one of those projects. One day hatchery work and caiman monitoring, another day reforestation. This morning, David and I had the opportunity to work on the latter as we cleared selected areas of nearby forest so that it can eventually become home for the trees that we helped tag when we first arrived. You might wonder how one goes about clearing rainforest. Any thoughts we might have had in that direction were quickly answered when Elena, the biologist in charge of the reforestation project, hands each of us freshly sharpened machetes. As both an asthmatic and allergy sufferer, I never dreamed I would be in the rainforest clearing brush that grows higher than I am tall—and with a machete, no less. Yet, the plant life seems to have little effect on me, except when the blades of some of the tropical grass leave small cuts in your skin. This leads me to my first tip. Tip #1: Be careful of tropical grasses. Some of the blades can cut your skin. If you have a machete, cut them down first before walking into the brush. After obtaining some instructions and watching Elena demonstrate what we had to do, we dutifully proceed to hack away at the overgrowth. Using a machete is by no means a delicate procedure—you make broad swings that cross your body and be careful not to swing near anyone. We learned very quickly what movements work best and how to adjust your swing so you use less muscle. Tip #2: Don’t try to “muscle” the machete, which will simply make you more tired in the end. Relax your muscles and allow gravity and the slight movement of your torso to propel your swing. Even though it is early in the morning, the heat is incessant and soon I am soaked to the skin with sweat. True to form, I clear an area that turns out to be a nest of fire ants and my feet are soon engulfed. Although I’m wearing socks and long pants that cinch at the ankle, they still manage to crawl up my pant legs. I have to slap at them while they are under my pants because they will be impossible to pick out. This means I now have dead fire ant carcasses sticking to my sweaty legs. Oh. dear. god. This brings me to the next tip. Tip #3: Fire ants can sting through your socks. And they don’t freaking care what sort of insect repellant you’re wearing. After hacking away for over an hour, my right arm—the arm with which I am holding the machete—gets supremely tired. I take a brief break for water and notice that the muscles in my arm are literally vibrating. I take note of it, then continue to hack away using the same arm. Soon, I manage to slice right over one of my left fingers. It’s not a big cut, but hurts like hell. This one is worth two tips. Tip #4: When your machete-wielding arm gets tired to the point that it’s shaking, switch to the other arm. I mean, duh. If you continue to use the tired arm, you will get sloppy. Tip #5: If you cut yourself with a machete, treat it immediately. 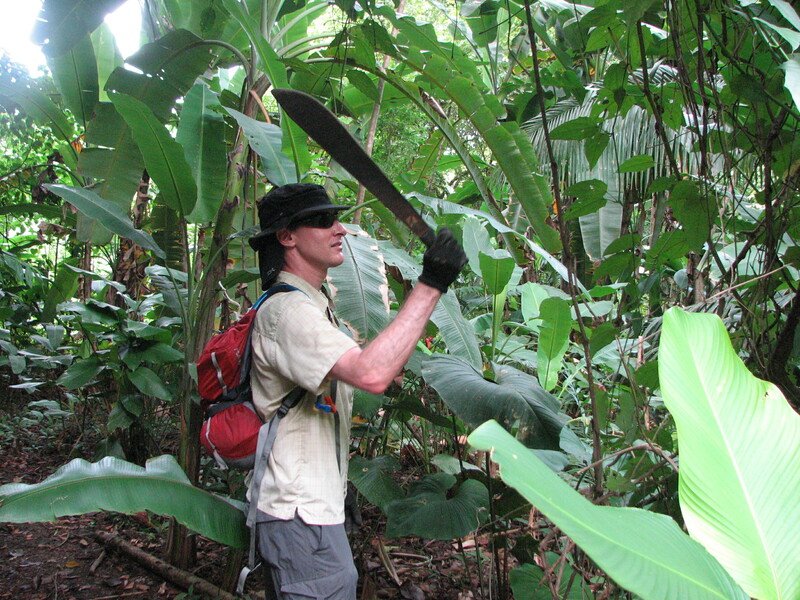 The machete is teeming with bacteria…and you’re in a tropical rainforest, for heaven’s sake. Things sometime heal a little slower here. We return to the center so my cut can be properly tended to (it’s handy traveling with a nurse…if it were realistic, I would make tip #6: “make sure your travel companion is a nurse”). After a bit of minor first aid, we head back to the site to continue our work. Elena notices something crawling through the grass. Our activity has disturbed it and it slithers to a hiding spot beneath a bush. She takes her machete and lifts up the flanks of the bush so we can see the boa constrictor. Its two-meter body is coiled beneath, silently waiting and watching us to see what we’re going to do. Its markings are brilliant. I’m bummed I didn’t get to see it while it was fully stretched out and slithering to its hiding spot. Tip #6: Be careful to look where you are stepping or cutting. You never know whose home you are disturbing. After clearing a respectable area for planting, we call it a morning and head back to the center for a well-deserved shower and rest. A toucan flies overhead. One of the ways you can identify a toucan is by the sound of its wings beating. The large bird flies awkwardly due to the weight of its beak and the sound of its wings beating the air to keep it aloft is both loud and distinctive. It’s a lovely conclusion to our morning. We used them when wading around in water, but I should have thought to use them in the forest as well. Thanks for the tip!